Have questions? Our experts are here for you. First introduced in Germany as a pharmaceutical over 40 years ago, Wobenzym N has been updated but still features the time-tested, synergistic combination of plant-based enzymes, pancreatic enzymes, and antioxidants. These powerful yet delicate enzymes are protected by a vegetable-based enteric coating which ensures optimal absorption and utilization in the bloodstream. If you experience joint pain, you know how frustrating it can be. It slows you down, interferes with your daily routine, keeps you away from your training. Maintaining healthy joints is crucial, prevention is key. Pain in one joint will force your body to compensate and shift its weight, ultimately putting stress on another. This can throw your whole body off kilter and lead to other joint issues. s we age, many of us may experience aches and pains on a daily basis, and it may not always be from extensive training. It may be because we have a few more years on the calendar or spend long hours in front of a computer or in the garden. When your joints and muscles are healthy, you have a greater range of motion, you’re a little lighter on your feet, and bending over to pick up a pencil is not such an ordeal. Wobenzym contains a highly concentrated enzyme compound of natural origin that helps to balance the natural inflammation response. Substances known as cytokines are directly involved in the inflammation process. Some cytokines promote inflammation, while others inhibit it, and Wobenzym helps flush out excess cytokines so immune balance is restored. 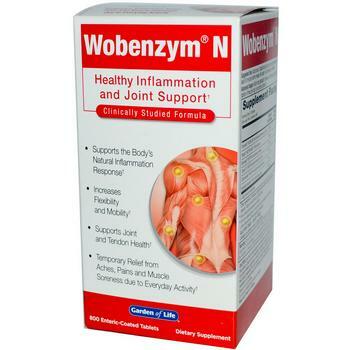 Wobenzym helps to prevent the symptoms of sports injury and soreness in your muscles, ligaments, tendons, and joints after a vigorous workout or competition. And the sooner the pain is gone, the sooner you’re back out there, taking on new challenges. NJ I never review anything I purchase but other reviews always help with my decision making when I do purchase items. So here is my review of this product I have fibromyalgia thyroid problems adrenal fatigue and lived in constant pain. I have received botox injection to help with pain and spasms for almost 5 years until I started taking this product. I wake up pain free and without headaches I can't believe I don't need the botox injections anymore either. For me and I've read others get an upset stomach when taking it but the benefits I get far out way the small amount of stomach upset. Anyone who has inflammation problems should try this product to see for themselves. The most potent Wobenzym yet with its increased activity compared to Wobenzym N and the more convenient 4-tablet-a-day dose, which means fewer pills to consume than other Wobenzym formulations.